The intern’s recent success with refilling the 1-lb propane canister emboldened them to seek out other “empties” around the office. 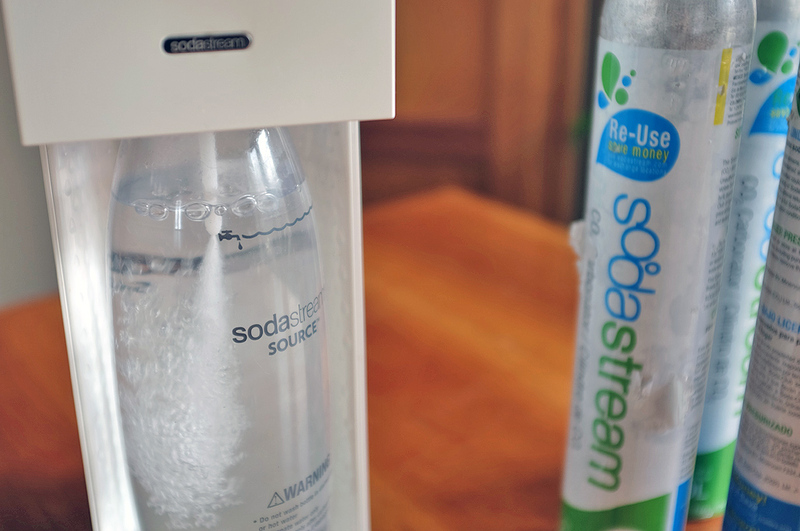 They noticed a lot of empty SodaStream canisters. “Hey, what about refilling those?” they asked each other excitedly. As we had been too lazy to get replacements, we told them to go to it, but to check their health insurance coverage, just in case. After thinking about it for a second, we decided that the grownups (aka us) should probably keep an eye on their…exuberance, and so the entire office took part in this DIY event. The first task was to determine how best to go about it. After some research, we determined that the easiest way was to use dry ice, which is just frozen CO2 (but then everyone knew that). The next task was to figure out where we could get dry ice. 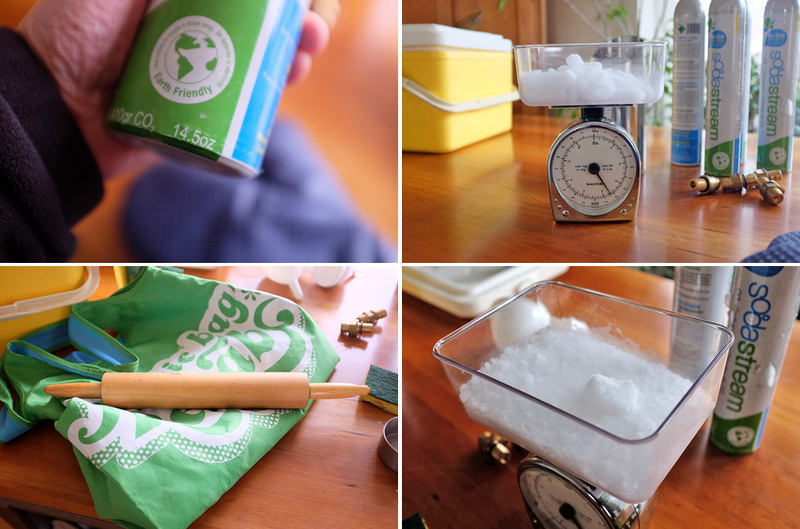 Turns out dry ice is pretty easy to get: most places that sell bulk ice will also have dry ice (probably). Our dandy copy editor/Boston tour guide found us an ice house a few miles from the office. The final task before actually refilling the canisters was removing the brass adapter/valve. It was a little tricky, but once we figured it out—it requires both a pipe and an adjustable wrench—it wasn’t hard to do. 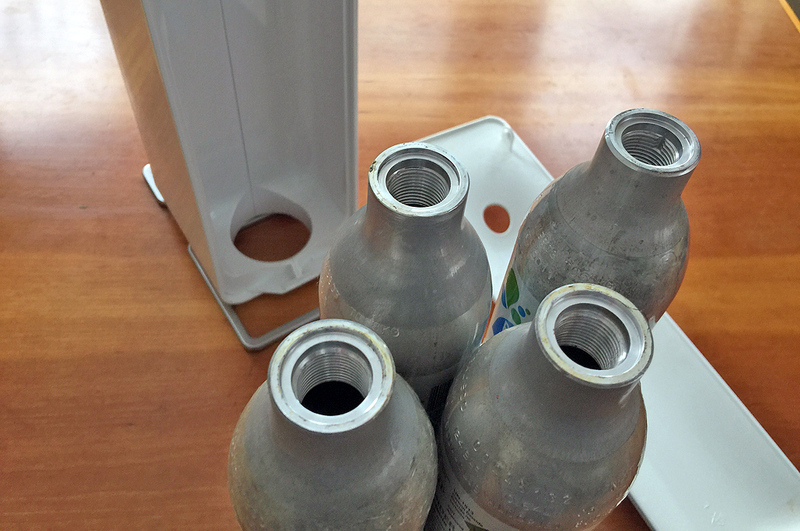 Once we removed all the adapters from all the bottles, we noticed something unexpected: they were not all the same! There were three different versions on our four bottles. See the differences? We calculated that five pounds of dry ice would be more than sufficient for filling all four canisters. The total cost of five pounds of dry ice? $13 and change. The cost of exchanging an empty canister for a full one? $20 each. Going the dry ice route was definitely worth it (as long as nothing went wrong). You may be wondering how we knew how much dry ice to use. 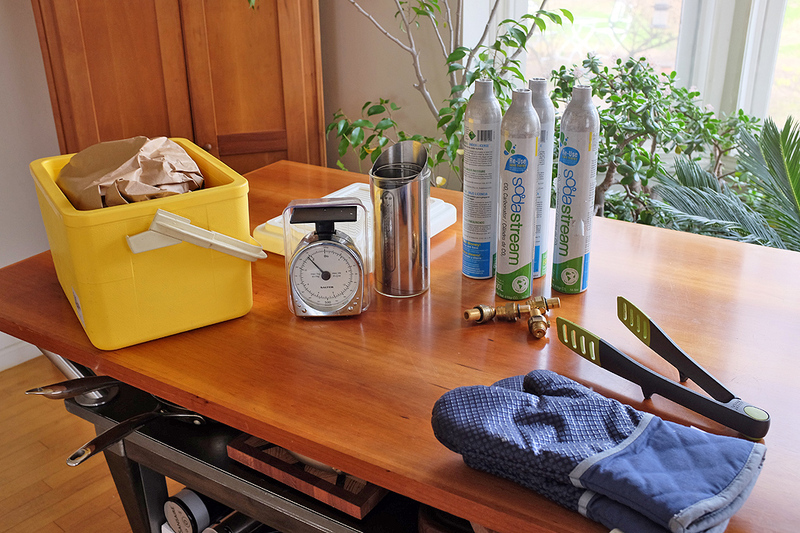 Conveniently, the bottle labels stated “14.5oz.” As its weight doesn’t change when dry ice sublimates into its gaseous state in a sealed canister, we had all the information we needed to restores our canisters to properly-pressured working order. 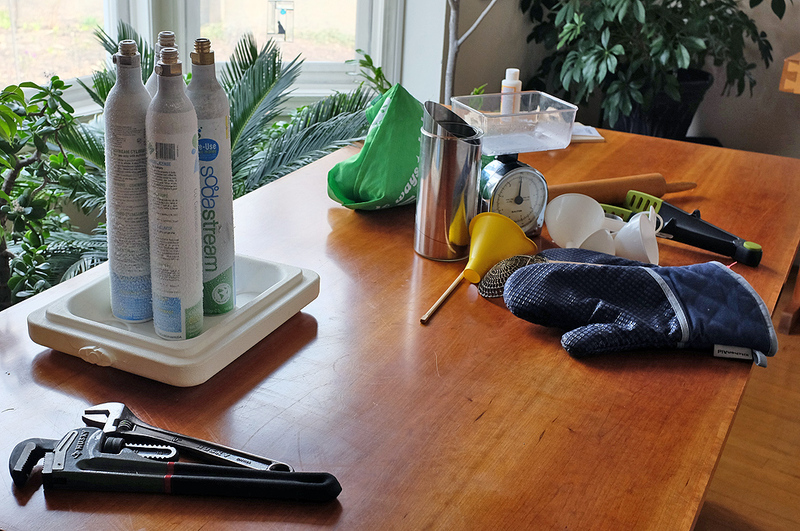 Always use proper safety equipment – like a pair of oven mitts and a twenty-year old cooler. Remove the brass adapter valve. Weigh out a pound of dry ice. 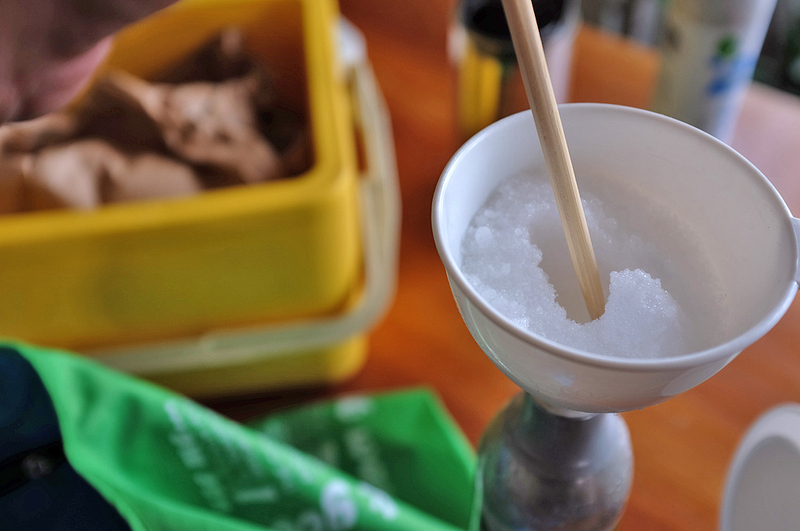 Crush the dry ice into finer granules. Transfer the granules into the canister. Replace the valve and tighten. Wait for the canister to return to room temperature before use. A color-coordinated ice-crushing bag is not a requirement for this DIY. Not required, but rather fetching. We weighed out 16 ounces instead of the 14.5 on the canisters, as we assumed there would be some loss during the transfer. While we got the smallest pellets the ice house had, they were still too big to fit through the necks of the canisters. We resorted to the standard ice-bashing method: we put the dry ice into a tough bag and crushed it with a rolling pin. The dry ice actually broke apart fairly easily, a lot easier than when we crush water-based ice. The granules flowed into the canister easily enough, although we found that a pointy chop stick was quite helpful in pushing the granules through the funnel and keeping things moving. Poke it with a stick! Go on, poke it! Once “filled,” the canisters were capped with the valve and set aside to self-pressurize. The canisters got VERY COLD in the process…and are not to be handled with bare hands at this stage!!! It’s like a DIY-off between a plumber and a baker. It took about two hours for the canisters to return to room temperature, after which they worked exactly as we had hoped! 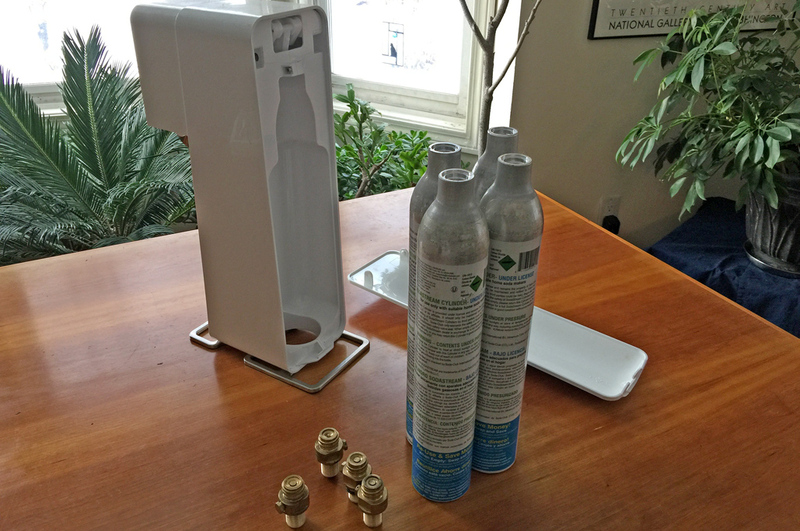 Each cartridge can carbonate up to 60 liters of water. We’ll track and see what our liter-age is and let you know. May I introduce you to Fizzy McFizzface. We are declaring this DIY a success!! !